Greg Mahle, left, and Peter Zheutlin will speak Tuesday in Amarillo. 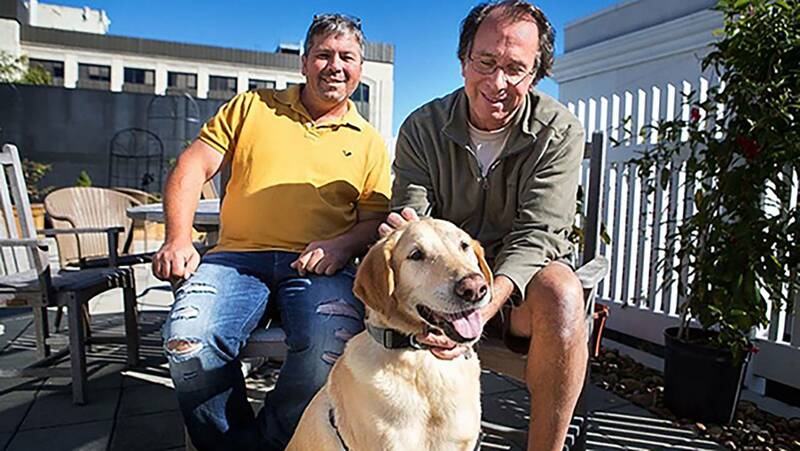 When, after 20 years of wheedling from his wife and children, author Peter Zheutlin finally broke down and adopted a dog, he had no idea how much it would change his life. "I resisted and I resisted," Zheutlin said. Then came Albie, a yellow lab who was found wandering in rural Louisiana and was held at a high-kill shelter for months before he was brought north by Greg Mahle, the operator of Rescue Road Trips, which takes unclaimed dogs from kill shelters in the south and transports them north. "Greg wrote the most beautiful post about his journey, and I was so taken with it," Zheutlin said. "This guy is obviously very passionate about his work and loves what he is doing." By that point, Zheutlin had only scratched the surface. Several months after Albie had been living with his family, Zheutlin finally met Mahle. "I told him I was touched by (the post) and what he had written, and I tried to persuade him to let me write a story about him," said Zheutlin, a freelance writer and journalist. "He was a little wary. He didn't know me, and the world he lives in is a very private little world. It's him and another driver in the truck. ... Having a third person along was an invasion, much less answering all of my questions for 4,000 miles." But Mahle relented, resulting first in a popular article for Parade Magazine, then Rescue Road, a New York Times-bestselling book celebrating Mahle and his mission. The book is this fall's selection for the Amarillo Reads community reading program through the Amarillo Public Library. Zheutlin and Mahle will speak about the book and Mahle's continuing work at a free event at 7 p.m. Tuesday in the Globe-News Center for the Performing Arts, 500 S. Buchanan St.; doors open at 6 p.m.
"The goal and the reason Greg participated is we felt if more people knew about this kind of thing, the plight and the story of these dogs, more people would step up and consider rescue as an option and not just go to the pet store or a breeder," Zheutlin said. "Frankly, I wanted to dispel all of the myths I had myself of adopting a rescue dog — that they were somehow damaged good ... or could be behaviorally challenged or have a terrible temperament. "What I've learned is nothing could be further from the truth," he continued. "There are challenges with any dog, whatever you get, but in my experience and in talking with people who've adopted, these dogs who've been through this journey, they're so grateful. I don't know what they remember of their prior lives, but they just want a home and want to be loved." Overcrowded shelters are less of a problem in the Northeast, Zheutlin said, because of a strong tradition of spaying and neutering animals. That's much less true across the South, he said. "It's a much bigger problem than I ever imagined it would be," he said. "One thing that was astonishing to me was the sheer scale of the problem, the sheer size of the canine overpopulation problem in this country." Mahle is one link in the chain, Zheutlin said. "It takes a lot of people to rescue a dog — from the person picking it up off the street to the incredible number of very devoted people playing their part in this for no motive other than they just care and they want to save dogs. Having said that, like in every other venture, there are good actors and bad actors. There are people maybe calling themselves 'rescue' and picking up puppies from God knows where and selling them out of the back of their pickup. "That's not rescue. That's a disaster." Since the book was published, followers of Mahle's Facebook page have increased from about 20,000 to nearly 100,000. There, they can chart Mahle's journeys up the road with his dogs. "It's for all the people down the line — the volunteers who picked up the dog, the vets and technicians who nursed them, the coordinator who made a match online, everybody who literally and figuratively laid their hands on the dog," Zheutlin said. "These Facebook journeys are a way to make those people who make Greg's trips possible ... vicariously enjoy the fruits of their labor, so to speak." And Mahle also is sending a message to the adopters of the dogs: "This is such a great day, it's so exciting and this is going to change your life, but it's also a big responsibility." Overall, Zheutlin said he views his book as "a way of saying thank you for having Albie in our life." "He survived thanks to the volunteer in the shelter in Alexandria, La., who bought him more time until we came along," Zheutlin said. "He's a sweet dog who has given us so much joy, and no one would have known who he was (without that volunteer). Now, he's got a good life up here."